Note: Not allowed to take pictures of the Wii U GamePad an Console since it's still using the E3 prototype. As a Club Nintendo member with Platinum status for three consecutive years, attending in the Wii U Experience in Los Angeles (September 21, 2012 that lasted 1 hour and 40 minutes) was the best reward that I ever received. I knew that I should enter the event with low expectations because of the possibility that all the demos available were similar to E3 a few months ago. I was 80% correct. There were in fact few demos that were release recently during the Nintendo Direct New York event such as Mario Chase and Pikmin Adventure from Nintendo Land, and there’s even a Challenge mode from New Super Mario Bros. U except that it’s only use as a tournament during the event. There were also six 3DS XL stations; unfortunately, the units only included New Super Mario Bros. 2. The event was crowded, that’s bad because I ended up experiencing three Wii U titles, and that’s good because of the crazy Streetpasses. That’s quite alright because most of the Wii U experience I prefer at home such as Zombie U, surrounded by dozens of people ruins the suspense. Personally, after experiencing the demo, I was disappointed. While it does have better ideas compare to all the previous installments, I can’t shake the feeling that I’m play New Super Mario Bros. Wii. The improve visuals doesn’t really help either since I’m most of the time focusing on my very tiny yellow Toad on the TV screen than the background. The only part of the demo that I was thrilled on was when I experiment with the obtain Flying Squirrel suit. When I shake the Wiimote, the squirrel Toad surprisingly rocketed upwards in a similar way from a special jump move in Super Smash Bros.
I’m not abandoning the game just yet. I’m probably be more entertain by New Super Mario Bros. U once Miiverse is included and trying out on the Challenge modes. Unfortunately, spending ten extra dollars on New Super Mario Bros. Wii doesn’t sound very appealing. After E3 2012, I previously did an article on my Top 5 Wii U titles that I’m looking forward to and Project P-100 was number one. After trying out The Wonderful 101, the only thing I want to edit from my post E3 article is to change Project P-101 to it’s glorious title. Here is when I hold the Wii U GamePad for the first time and I immediately love the innovated controller once it rumbled. The team of heroes, with “Viewtiful Joe” as the leader, can attack normally all at once (Team Attack) with the X button and there are multiple forms of unite attacks. Before activating the unite attack with the A button, “Viewtiful Joe” must first get his team in formation such as forming a straight line with the right analog stick and pressing A will call out a sword. The more individual heroes (holding the direction on the right stick) participating in getting in line the more powerful and longer the sword will become to take down a mech that would end up being smaller in comparison. Using the Unite Attacks will drain your batteries and must switch to normal Team Attack to let your batteries to recharge. “Viewtiful Joe” can recruit more heroes by circling unprotected citizens with the right stick. Unite Attack can also be perform on the GamePad touch screen. Unfortunately, it is not as successful as when using the right stick. Remember this is still an E3 demo. Progression is similar to retro brawlers in the arcade, destroying all enemies in the area before progressing onward and there are scripted events such as a giant helicopter blocking the path and outrunning an earthquake. Most of the gameplay is on the chaotic streets. Luckily, I manage to witness a section of the demo when “Viewtiful Joe” actually enters a building and the gameplay shifts to the GamePad screen in third-person perspective while still viewing the same building from the outside on the TV screen for puzzle solving. When I finally see the gameplay on the GamePad screen with bursting colors from the main protagonist and beautiful depth perception, I thought for a second that I was viewing it in stereoscopic 3D. This proves that I was very impressed of how the game looks on the GamePad. 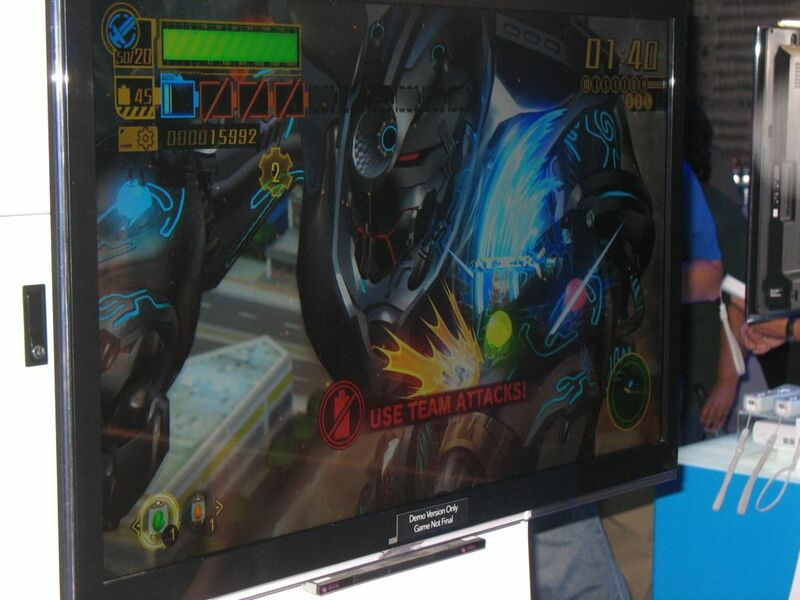 The demo was well built; each section demonstrates each type of Unite Attacks and gameplay. If you spent too much time on a section, the demo will automatically jump to a boss fight. I was told that I was the farthest that anyone has gotten before automatically enter the boss fight and by that point the demo finally has a crowd. The team of heroes is now on top of an arm of a giant mech that is roaming the destructive streets. The team must take down three glowing weak spots while avoiding the other unpopulated arm with well-timed Unite Defenses with the ZL and ZR, unsuccessfully will end up some of your recruits to fall off. There is so much mayhem going on during the boss fight that I was amazed that the game runs very smoothly. It’s the exact same demo shown from Ubisoft conference during last E3. There is a middle section that wasn’t shown and that is when I get to use a giant slingshot from the foreground with purist pulling to help out my partner with the stylus. Here I notice that both the TV and GamePad screen showing the same gameplay and their beautifully identical. 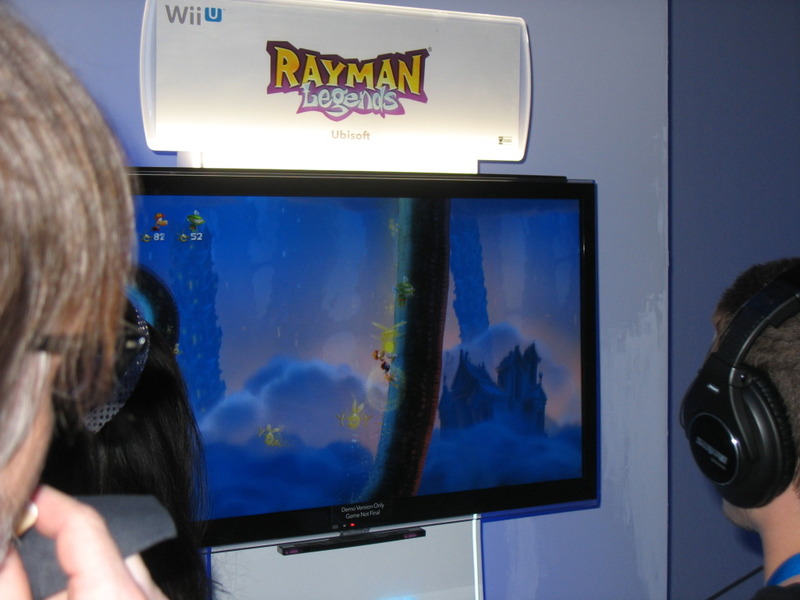 I also try out the Wii U Pro Controller as Rayman. After spending a minuteof getting use to the new classic design, It’s similar to the Classic Controller Pro. I got out of the event very impressed. The Wii U GamePad feels great and it’s difficult to accidentally drop it. All the demos are graphically stunning. The demos that I actually experience delivers the confidence that I will not have regrets of owning the system and knowing which launch titles to avoid if I do end up getting the system at launch (wish is unlikely at this point). This is the best Club Nintendo reward so far. My cousin work at Nintendo of America maybe I can help set up a official censored interview to help WiiWareWave? That is awesome that you were able to attend! Will you be posting more news articles about the event over the weekend? Hopefully, I'll have the chance to attend at least one Nintendo related event in my lifetime. I've always wondered what it would feel like to be surrounded by nothing but hundreds of other gamers with the same interests as myself. I'm going to the Indianapolis WiiU experience if I can manage to get 100 more coins by next weekend.